For what seems like forever, medical scientists have been trying to figure out the relative disease-causing importance of two types of protein often found in the brains of Alzheimer’s disease (AD) victims: tau and amyloid-beta (Aβ). While the larger question is still unresolved, recent research may have made a significant discovery about the tau protein. The research indicates mechanisms involved in the very early stages of AD, so it may lead to diagnostic tests that can signal the beginnings of the disease long before symptoms become apparent. This might allow for timely applications of preventive therapies, and might even contribute to the discovery of such therapies. The development of a complex multicellular organism from a single-cell zygote into a complete animal (or plant) is somewhat of a neat trick. It’s impressive that from the zygote perhaps a couple hundred different types of cells can emerge, with each of the trillions of final cells at the right time and place. What’s just as surprising is that the whole process is so neatly programmed by evolution into an organism’s genome that it happens automatically as the appropriate set of genes gets turned on at just the right time. Developmental biologists have been studying the process for decades. What they’ve found is that cells at any particular stage not only make up specific types of embryonic tissue, but are also programmed to turn on genes for the next generation of cells based on the types of tissue and nearby tissue they occur in. Biologists have now learned enough about the details of this program that they can make it work – for certain tissues and organs – in a lab dish instead of a complete embro, starting from pluripotent stem cells. In research just published, the organ was a mouse pituitary gland, a very small organ, but with complex function. In humans it’s about the size of a pea and weighs only half a gram. But it secretes dozens of different endocrine hormones. It’s particularly important that the gland has a 3-dimensional structure that’s essential to its function. Being able to grow a pituitary gland from stem cells is a very significant achievement towards eventual regenerative medicine, in which larger and more complex organs such as kidneys or even hearts can be grown from stem cells. The possibility that functional, three-dimensional tissues and organs may be derived from pluripotent cells, such as embryonic stem cells (ESCs) and induced pluripotent stem cells (iPSCs), represents one of the grand challenges of stem cell research, but is also one of the fundamental goals of the emerging field of regenerative medicine. Developmental biology has played a central role in informing such efforts, as it has been shown that stem cell differentiation can be directed to follow a given lineage pathway by culturing stem cells in conditions that recapitulate the specific cellular and molecular environment from which such cells normally emerge during embryogenesis. Intriguingly, recent work has shown that when ES cells are cultured under the appropriate conditions, they can be driven to self-organize into complex, three-dimensional tissue-like structures that closely resemble their physiological counterparts, a remarkable advance for the field. New work by Hidetaka Suga of the Division of Human Stem Cell Technology, Yoshiki Sasai, Group Director of the Laboratory for Organogenesis and Neurogenesis, and others has unlocked the most recent achievement in self-organized tissue differentiation, steering mouse ESCs to give rise to tissue closely resembling the hormone-secreting component of the pituitary, known as the adenohypophysis, in vitro. Not only did the lab-grown pituitary tissue have much of the appropriate physiological activity, but when transplanted into mice whose pituitary gland had been removed, the mice survived much better than controls. BRCA1 is a gene whose name is among the most familiar to the general public of all genes – for the unfortunate reason that mutations of BRCA1 are associated with significantly increased hereditary risk for breast cancer (as the name suggests). Strangely, however, it’s still not known exactly how mutations of BRCA1 confer this greater risk for cancer. But recent research has narrowed down the possibilities. The protein that the gene codes for, BRCA1, is a fairly long chain of 1863 amino acids. BRCA1 is known to be involved in repair of damaged DNA. If BRCA1 is defective (due to a gene mutation), the failure to properly repair DNA (which can become damaged for many possible reasons) can lead to a cell becoming cancerous. Previous research has identified around 1500 different mutations of BRCA1 associated with cancer risk. But most of these mutations directly affect the amino acids of only two different regions of BRCA1. Every protein has an amine group at one end of its chain and a carboxyl group at the other end. One of the two regions in which mutations lead to cancer is at the amino end and is called the “RING domain”. The other region, near the carboxyl end, is called BRCT (BRCA1 carboxyl-terminal tandem repeats). The RING domain is known to have a role in the process that attaches a marker called ubiquitin to a protein in order to identify the protein as ready for recycling. The BRCT region is associated with the process of protein phosphorylation, which is a key element of chemical signaling within cells. What hasn’t been known is what aspects of DNA repair are disrupted by defects in one or both of these regions. Reactive oxygen species (ROS, sometimes loosely referred to as “free radicals”) are generally harmful to cells. Persistent high levels of ROS may damage cells and, eventually, cause cancer. But ROS are also harmful to cancer cells – which, therefore, often develop means of defending themselves against ROS. By activating an enzyme involved in the breakdown of glucose, researchers were able to slow the growth of lung cancer cells and increase the harm inflicted by reactive oxygen species (ROS)—byproducts of normal metabolism that can cause damage to the cell in high concentrations. The findings, published Thursday (November 3) in Science Express, could one day be used to make cancer cells more susceptible to cancer treatments and minimize tumor growth. It’s long been known that cancer cells often have an alternate form of the enzyme pyruvate kinase M1 (PKM1) – PKM2. The new research shows why this is: cancer cells can control the activity of PKM2, which is not possible with PKM1, and this control helps them defend against ROS. Cancer cells need such a defense, because their metabolism differs from normal cell metabolism and is more active, tending to result in higher ROS levels. The way this works is that both PKM1 and PKM2 play an important role in the glycolysis process, which metabolizes glucose. Glutathione is an antioxidant molecule that can help neutralize ROS. But it also participates in glycolysis, which diverts it from acting as an antioxidant. Cancer cells favor PKM2 over PKM1, because they can lower its level of activity, and therefore leave more glutathione available for antioxidant work. The researchers equipped cancer cells with a mutant form of PKM2 that, like PKM1, the cells could not control. Such cells were found to sustain more damage from ROS. And when altered cells were implanted in mice, they grew smaller tumors than unmodified cancer cells. There are fairly obvious ways that these findings may help develop better cancer therapies. The positive effect of calorie restriction on lifespan in many organisms is well established, but scientists are still working to understand the mechanism. The latest finding, in fruit flies, is that artificially increasing the number of mitochondria in the cells of the intestines – which happens naturally under conditions of calorie restriction – may be partially responsible for the effect. This chain of connections between the mitochondria and longevity inspired Jones and her colleague to investigate what happens when the PGC-1 gene is forced into overdrive. To do this, they used genetic engineering techniques to boost the activity of the fruit fly equivalent of the PGC-1 gene. The flies (known as Drosophila melanogaster) have a short lifespan, allowing the scientists to study aging and longevity in ways that aren’t as feasible in longer-lived organisms such as mice or human. The researchers found that boosting the activity of dPGC-1, the fruit fly version of the gene, resulted in greater numbers of mitochondria and more energy-production in flies – the same phenomenon seen in organisms on calorie restricted diets. When the activity of the gene was accelerated in stem and progenitor cells of the intestine, which serve to replenish intestinal tissues, these cellular changes correspond with better health and longer lifespan. The flies lived between 20 and 50 percent longer, depending on the method and extent to which the activity of the gene was altered. The research suggests that the mechanism by which health and longevity are increased involves greater robustness in the intestinal tissue as a result of having more mitochondria. [W]e show that overexpression of the Drosophila PGC-1 homolog (dPGC-1/spargel) is sufficient to increase mitochondrial activity. Moreover, tissue-specific overexpression of dPGC-1 in stem and progenitor cells within the digestive tract extends life span. Long-lived flies overexpressing dPGC-1 display a delay in the onset of aging-related changes in the intestine, leading to improved tissue homeostasis in old flies. Together, these results demonstrate that dPGC-1 can slow aging both at the level of cellular changes in an individual tissue and also at the organismal level by extending life span. Our findings point to the possibility that alterations in PGC-1 activity in high-turnover tissues, such as the intestine, may be an important determinant of longevity in mammals. Do bacterial cells get “older” after repeated divisions? What would that even mean, once an original “mother” cell has divided into two “daughters”? Well, there are certain things one might look for as indicators of aging. For example, accumulation of molecular damage and slower rates of division in succeeding generations. Previous studies have given conflicting results. One one hand it seems that many bacterial cells in later generations do show signs of having aged. But on the other, if aging is measured over the average of the whole population, it isn’t found. The latest study found that, just as a population genetic model predicted would be optimal, half the daughter cells in a new generation appeared to be young and rejuventated, while the other half had accumulated the signs of aging. The UC San Diego biologists’ answer—that bacteria appear to give more of the cellular damage to one daughter, the one that has “aged,” and less to the other, which the biologists term “rejuvenation”—resulted from a computer analysis Chao and colleagues Camilla Rang and Annie Peng conducted on two experimental studies. Human induced pluripotent stem cells (iPSCs) are adult body cells that have been treated in vitro to revert to a pluripotent state very close to embryonic stem cells. They were first produced in 2007, and the process of generating them has become progressively faster and more efficient. The resulting iPSCs now also have fewer defects and are less susceptible to becoming cancerous. Although iPSCs are not precisely the same as embryonic stem cells, they share the property of lacking all traces of cellular aging, such as shortened telomeres and altered metabolism. In other words, they have been rejuvenated, having full-length telomeres and normal mitochondrial metabolism, gene expression profiles, and levels of oxidative stress. Like other pluripotent cells, iPSCs can in principle differentiate into any type of body cell. Progress is being made in figuring out the exact recipe needed to actually produce cells that are equivalent to any adult cell type – some types are easier to make than others. Given adult cells, of any particular type, derived from iPSCs, the natural question is whether such cells are also free of traces of aging that existed in the original adult cells from which the iPSCs were derived. The answer is that they are rejuvenated in comparison to the cells they were originally derived from – even if those original cells came from human centenarians, and (surprisingly) even if the original cells had entered the senescent stage in which they could no longer divide. Of course, all this work was accomplished in vitro. There’s no obvious way to apply it to the whole body of an older person, or even to a complex organ. Perhaps such cells can eventually be used as a therapy for patients with Parkinson’s disease or to grow replacement arteries or tracheas. But that kind of development is still somewhere in the future. [S]enescent cells, programmed into functional iPSC cells, re-acquired the characteristics of embryonic pluripotent stem cells. In particular, they recovered their capacity for self-renewal and their former differentiation potential, and do not preserve any traces of previous aging. To check the “rejuvenated” characteristics of these cells, the researchers tested the reverse process. The rejuvenated iPSC cells were again differentiated to adult cells and compared to the original old cells, as well as to those obtained using human embryonic pluripotetent stem cells (hESC). “Signs of aging were erased and the iPSCs obtained can produce functional cells, of any type, with an increased proliferation capacity and longevity,” explains Jean-Marc Lemaitre who directs the Inserm AVENIR team. 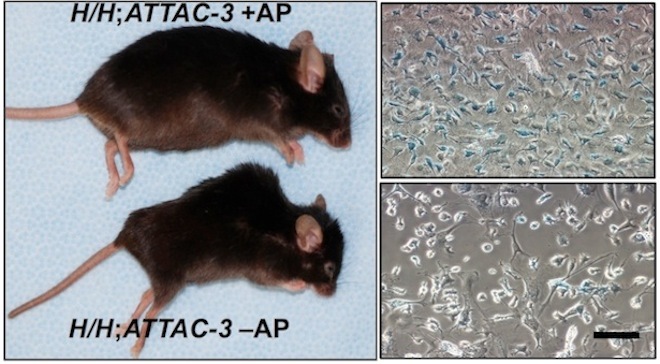 The key to this new development was finding an improved recipe for the transcription factors used to effect reprogramming. In addition to the usual four factors (OCT4, SOX2, c-MYC and KLF4), the researchers included NANOG and LIN28 to erase traces of cell senescence. Research into longevity, that most fundamental and intractable of all human health challenges, moves slowly. It deserves to be described in terms of years, not individual studies. But once in a rare while, a finding has the potential to be a landmark. Such is the case with a new experiment that flushed old, broken-down cells from the bodies of mice, slowing their descent into the infirmities of age. The large caveats that inevitably apply to mouse studies still apply here, in spades. But even with those, the findings mark the first time that cellular senescence — its importance debated by biologists for decades — has been experimentally manipulated in an animal, demonstrating a fantastic new tool for studying its role in human aging. The research involved a series of experiments, and if you’re up on your molecular biology, the details are interesting. Epigenetic changes in your parents’ chromosomes could affect your lifespan. At least, that is, if you’re a simple roundworm. Recent research has shown that some epigenetic changes in plant DNA can be inherited. (See here, here). However, these changes aren’t robust, and tend to drop out after a few generations. The epigenetic changes in plants that were heritable involved DNA methylation. 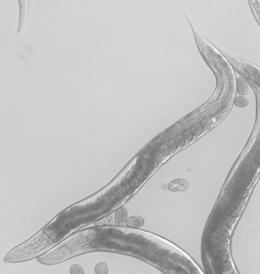 The new research on roundworms (Caenorhabditis elegans) concerned a slightly different type of epigenetic change: methylation of a histone protein. Histones make up chromatin, the scaffolding around which DNA is wrapped around in chromosomes. There are four different histones, and two copies of each of these form a nucleosome. About 146 base pairs of DNA are wrapped around each nucleosome. The expression of genes whose DNA is wrapped around a nucleosome can be affected by the methylation state of the H3 histone. Previous research had found that decreased levels of methylation of a specific part of the H3 histone resulted in longevity extensions of C. elegans by up to 30%. More specifically, a protein complex called H3K4me3 does the job of methylating the critical location in the H3 histone. Mutations of certain components of H3K4me3 were known to bring about the longevity extension effect. Anne Brunet, an associate professor of genetics at the Stanford School of Medicine, found that mutations in a chromatin-modifying complex also significantly increased lifespan in C. elegans. The complex, known as the histone H3 lysine 4 trimethylation (H3K4me3) complex, is responsible for methylating a chromatin packaging protein called histone H3. This methylation is often associated with the increased expression of genes in the vicinity. When Brunet and her colleagues knocked down members of the H3K4me3 complex—such as the WDR-5 and SET-2—they extended C. elegans life by up to 30 percent, suggesting that the epigenetic changes regulated by the complex controlled genes related to lifespan. “Basically we think that the reason why those worms live longer is because they have less of this H3K4 mark at specific loci in the genome,” Brunet explained. “That probably results in changes in the expression of some genes,” such as those that regulate the aging process, she added. That much was understood before the latest research. The new and rather surprising thing the new research has shown is that even if the mutations affecting H3K4me3 levels are eliminated in succeeding generations, the longevity extending effect persists for two more generations. The research found that expression of certain genes affecting metabolism – which often in turn affects longevity – persisted across generations, suggesting that other, as yet unknown, epigenetic changes occurred due to the original changes in H3 methylation. Our observations are consistent with the notion that H3K4me3 at specific loci may not be completely erased and replenished. Alternatively, the ASH-2/WDR-5/SET-2 complex could control the expression of the genes responsible for the erasure and replenishment of histone methylation marks between generations. Modulation of H3K4me3 modifiers in parents may also affect an unidentified protein or RNA that could in turn be inherited and cause lifespan changes. Gene therapy sounds good, in principle, as a means of treating diseases that result from genetic defects. But there have been at least two major practical problems in making use of gene therapy in the clinic. First, it’s very important for the safety of the procedure to make changes only to the defective gene (or even just the critical part of the gene) and no other portion of the DNA. Second, there needs to be an effective way to deliver the therapy, in whatever form it takes, to exactly the right tissues in the body that are affected by the defective gene. Solving these two problems simultaneously is especially difficult. There are a variety of techniques for modifying DNA in specific ways, using a number of specialized enzymes. But these techniques are actually usable only in a test tube. Simply setting the enzymes loose in a patient’s body doesn’t work. The usual way to get around this is by preparing the appropriate modified DNA segments and incorporating them into “vectors”, such as some sort of virus, and introducing the vector into a patient’s body, in the hope that it will reach the right tissues to deliver the DNA, without causing any other problems. That hasn’t worked very well, so far, despite a large number of attempts. What about taking some cells from the patient, modifying their DNA in vitro and then putting them back in the body? The problem there is being able to produce enough cells with good DNA, either before or after reintroduction to the patient’s body, to make a significant difference. Most human cells just don’t reproduce very prolifically outside the body, or even inside for that matter. At this point you should be thinking, “stem cells!” They are specialized to reproduce quickly, when needed. Up until now, there have been practical problems here, too. Adult stem cells capable of differentiating into the specific type of cell needed in a given tissue may be difficult or impossible to find in useful quantities. And embryonic stem cells, well, even any other problems aside, there’s the problem of avoiding rejection by the patient’s immune system. The potential solution: induced pluripotent stem cells (iPSCs), made from any convenient cell type of the actual patient. It’s only been five years since iPSCs were first produced. Various practical problems have arisen along the way since then. Some have been mostly overcome; some haven’t. But progress seems to be occurring steadily – including very recently. The application to gene therapy involves making appropriate corrections to the DNA, producing a sufficient number of differentiated cells of the required type from the “fixed” iPSCs, and finally reintroducing them into the patient. Alpha 1-antitrypsin deficiency is a genetic disorder caused by a point mutation that results in inadequate production of the alpha 1-antitrypsin (A1AT) enzyme in liver cells. The disease affects functioning of the lungs, as well as the liver. Research just published has shown that gene therapy to correct the mutation, applied to iPSCs, is successful at treating the condition in a mouse model. Researchers from the University of Cambridge, directed by Ludovic Vallier and David Lomas, and from the Sanger Institute, coordinated by Allan Bradley, began by sampling patients’ skin cells, which were then cultured in vitro for “differentiation” before applying the properties of the pluripotent stem cells: this is the “iPS cells” stage. Through genetic engineering, scientists were then able to correct the mutation responsible for the disease. They then engaged the now “healthy” stem cells in the maturation process, leading them to differentiate to liver cells. Scientists from the Institut Pasteur and Inserm, led by H-l-ne Strick-Marchand in the mixed Institut Pasteur/Inserm Innate Immunity unit (directed by James Di Santo), then tested new human hepatic cells thus produced on an animal model afflicted with liver failure. Their research showed that the cells were entirely functional and suited to integration in existing tissue and that they may contribute to liver regeneration in the mice treated.